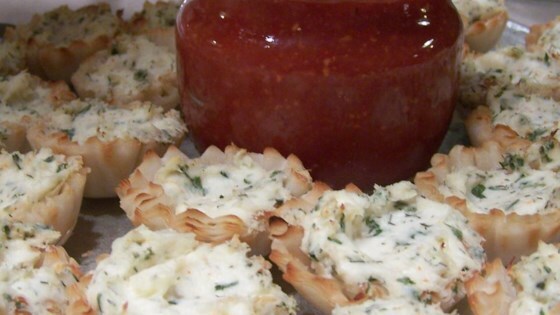 "No-bake phyllo shells are filled with creamy, seasoned crab dip." In a small mixing bowl, combine crab meat, cream cheese, dill, garlic, and parsley. Blend well. Spoon the mixture into thawed shells. Spoon cocktail sauce on some or all of the shells (if desired). Keep the crab shells refrigerated until serving. An easy appetizer for creamy crab with jalapeno inside crispy phyllo pockets. I made this recipe but added tabasco to it for a kick and also made my own puffs. Served at a wedding for 300 and everyone raved. None left on the platters. TOO MUCH CREAM CHEESE! I re-made this with 1 package of cream cheese and it was delicious! This is so easy and impressive I am using it for all my parties from now on.